320 janitors and volunteers will be alerted in the 2018 Asian Games. They will be divided in three locations using the shift system.
" 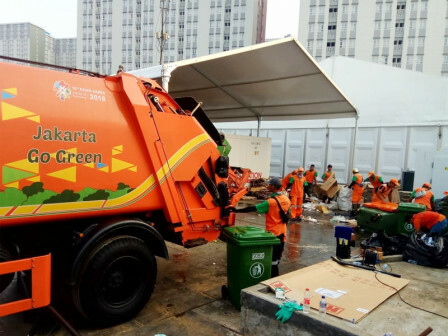 The janitor will sweep and pick up the trash during and finish the match so the venue stays clean as well as at the athlete's homestead"
Central Jakarta Environment Sub-dept. Head, Marsigit stated that they would be spread in JIExpo Kemayoran venue, athlete's homesteads and venues at the Gelora Bung Karno Stadium. They will work from 6 AM-2 PM and 2-8 PM. "The janitor will sweep and pick up the trash during and finish the match so the venue stays clean as well as at the athlete's homestead," he expressed, Monday (8/13). He added that 50 volunteers among them would monitor and educate the audience not to litter while the match lasts. "The supporting facilities that we prepare are 16 convectors, 10 sweepers, and 20 toilet cars divided in three locations that are currently on standby at the location," he said.